Hooray! It's the most wonderful time of the year - Giveaway Day! Thank you for visiting Daydreams of Quilts. You can learn more about me, my quilts and where I live here. Please feel free to take a look around my blog. 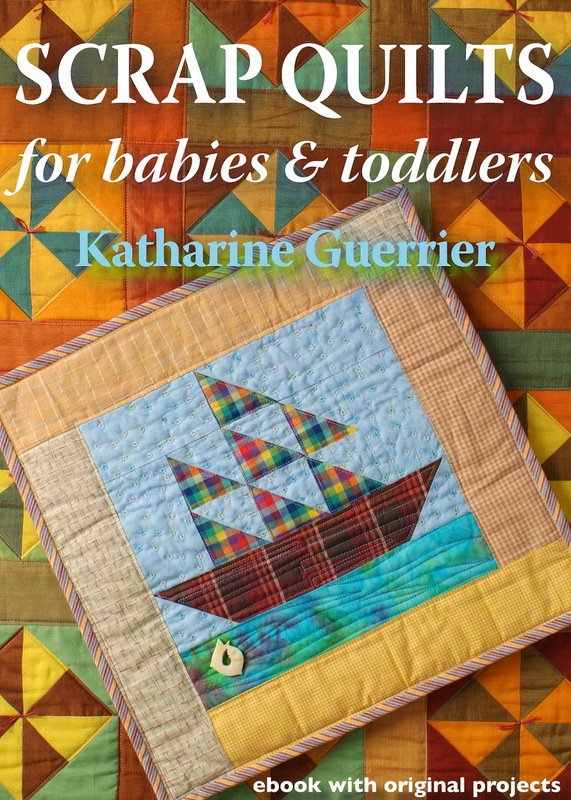 My blog affiliate Vivebooks has generously sponsored a giveaway of an ebook on CD of Scrap Quilts for Babies & Toddlers by Katharine Guerrier. They have also provided a discount code for all of my blog readers to receive 10% off the price of the book. To receive the discount type Discount Code: daysdreamssqbt This code will expire after December 21, 2014 and is not valid with any other offers. To get the discount, type the discount code in the box on the basket page of their website and then click Apply Coupon. This book has ten beautiful and colourful small quilt projects suitable for babies and toddlers. There is a range of pieced patterns to fit all skill levels and budgets. These are great stash busters! I love the sailboat wall hanging on the cover. I think this would be great in my nine-year-old son's room. I have plans to sew him a sail boat quilt so I will use the scraps to make this pattern into a throw pillow. There is a beautiful rainbow HST (half square triangle) quilt. I love HSTs and if you're a beginner this is a great way to incorporate triangles into your quilts without the trouble of working with bias edges. When I first started quilting I would only sew patterns made up of squares but HST's are squares that look like triangles so they're a piece of cake. There is even a quilt for a favourite teddy bear which would also work well as a bassinet quilt for a newborn or as a car seat quilt. The Autumn pinwheels quilt (in the background above) is made with gorgeous Oakshott cottons (something on my Christmas wish list!) and it only requires 14 fat eighths so it's affordable. I recommend Scrap Quilts for Babies & Toddlers for both beginners and experienced quilters alike. I have another ebook giveaway of "Patchwork Postcards and Pinboard Quilts" by Katharine Guerrier here. Open internationally until Dec. 10, 2014. I have fabric giveaways here (Canada and US) and here (International). Thank you to Sew Mama Sew for hosting Giveaway Day. Head over there to enter all the great giveaways!